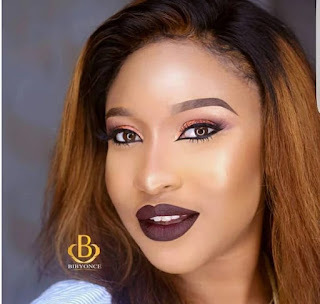 Nollywood actress Tonto Dikeh's marriage is allegedly in troubled waters,the actress and mother of one drops her husband's surname Churchill and reverts to her maiden name Dikeh,Tonto married to Oladunni Churchill in 2015. The marriage of Nollywood actress Tonto Dikeh seems to be in troubled water.This is following rumors being spread because she has removed her husband’s last name Churchill from her Instagram page which she added 15 months ago when they got married. Instead of her husband name what she has now on her Instagram is Tonto C. Dikeh. The actress has also taken down Mrs and Yummy Wife/Mom from her Instagram bio, though the actress is yet to delete her husband’s photos from her Instagram. Tonto took sabbatical leave from acting immediate after her marriage.She gave birth to her son who she fondly called King on February 17, 2016.The actress has dedicated her whole time to her marriage and motherhood unlike her colleagues who are married and are hitting movie locations.